Noel Francisco attends his Senate Judiciary Committee confirmation hearing for his nomination to become solicitor general, on May 10, 2017, in Washington, D.C. 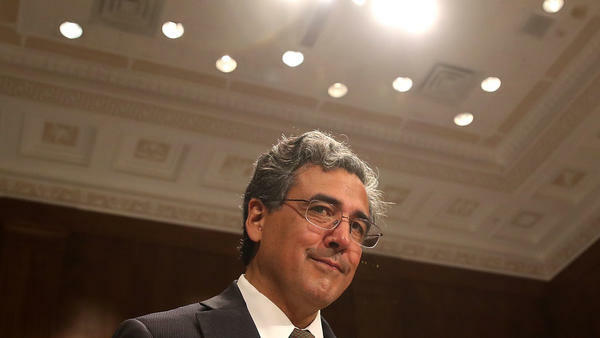 Solicitor General Noel Francisco is a familiar face in conservative legal circles. But he could be about to enter a new and uncomfortable period in the national spotlight if he becomes the chief overseer of the special counsel investigation into Russian interference in the 2016 presidential election. Francisco, 48, has been the Trump administration's top representative at the Supreme Court since September of 2017, when a divided Senate voted 50 to 47 to confirm him to the post. He's the third-ranking Senate-confirmed officer inside the Justice Department. Attorney General Jeff Sessions has recused himself from the Russia investigation. If Deputy Attorney General Rod Rosenstein, who oversees it, were removed from his position, that responsibility would fall to Francisco. President Trump has said he's holding open his options for dealing with the Justice Department. He has joined Republicans in Congress in complaining about the "bias" of people inside federal law enforcement, about the frame job they say is being perpetuated, and what they call Rosenstein's slowness in producing documents to lawmakers. Rosenstein said this week he would not be "extorted" but eventually, Trump warned, he may act on his own. "Why such unequal 'justice?'" he wrote on Twitter. "At some point I will have no choice but to use the powers granted to the presidency and get involved!" If that means Rosenstein could be dismissed, that would set up Francisco to take his place. Francisco launched his career with clerkships for the late Justice Antonin Scalia and the retired appeals court judge J. Michael Luttig. Two of his mentors told NPR the solicitor general spot is a "dream job" for Francisco, who was a law partner at the Jones Day firm with White House counsel Don McGahn and several other attorneys who assumed top legal positions in the Trump administration. Even so, the idea of Francisco taking over responsibility for the Russia probe makes little sense to Chris Christie, the former New Jersey governor who also served as U.S. attorney for that state. "I can tell you, Noel Francisco, very talented lawyer, but to be Solicitor General, you have a specific skill set and running a Russia collusion investigation is probably not one of them," Christie told ABC News in April. In fact, Francisco is on record expressing doubts about the role and reach of special counsels. In 2007, he told a House panel, "my own personal belief is that when you hand these issues off to career prosecutors in the public integrity sections in the U.S. attorneys' offices in the Department of Justice, those attorneys are generally better able to assess whether a case should be pursued." Francisco may be best known for arguing, and winning, the case of former Virginia Gov. Bob McDonnell, who was convicted of bribery and public corruption offenses. The Supreme Court ultimately threw out the conviction. Francisco also won a case invalidating the Obama administration's use of recess appointments at the National Labor Relations Board. "I have total confidence in his integrity, I think he's a great person, he's been a great friend, and he's been a fantastic lawyer," said Hank Asbill, who worked with him on the McDonnell case. Asbill said his former law partner would be "totally equipped" to oversee the Russia probe. "I'm sure if Noel is asked to make any decisions in that regard that he'll evaluate the relevant facts and the legal issues on the merits ... and he'll make whatever decision he thinks is the most appropriate," Asbill added. Francisco served as a junior lawyer in President George W. Bush's White House and worked in the Justice Department's elite Office of Legal Counsel in the Bush years. He was part of the team of attorneys who helped Bush, working around the clock during the recount process in Florida during the 2000 election. "It was exhausting but extremely important, obviously," said Chuck Cooper, who hired Francisco to work at his law firm during that period. "The potential that we saw in him as a very young lawyer ... is something others have seen in every stage of his career." More recently, he endeared himself to conservatives by defending the Bush administration's firing of U.S. attorneys. In 2016, Francisco wrote an opinion piece in the Wall Street Journal titled, "The FBI Treated Clinton with Kid Gloves." None of those things came up during his Senate confirmation hearing in May 2017, which took place the morning after President Trump fired FBI Director James Comey. Comey's dismissal was what helped prompt Rosenstein to appoint a special counsel to investigate allegations of Russian election interference. At the hearing, Francisco spoke with emotion about his late father, who spent his childhood in the Philippines, ravaged during World War II. "He once told me as a young boy, he was forced to live in the remnants of a bombed-out tank," Francisco recalled. "Whenever I face the joys or difficulties of life, I think of that little boy." Later in the hearing, Francisco told Senators he knew he would have a responsibility beyond simply winning or losing in court. "After all," he said, "the Department of Justice's goal is not just to win, but to ensure that justice is served." It's too soon to assess Francisco's record as solicitor general. The office has reversed course many times from stances the Obama administration took. But Cooper, a mentor to Francisco, said that's to be expected given the substantial policy shifts between the two White Houses. But one move from the office drew bipartisan outcry. The solicitor general filed court papers suggesting opposing lawyers at the American Civil Liberties Union should face discipline in a case involving an undocumented immigrant seeking an abortion. Two sources told NPR that people had urged the solicitor general not to file the document, but he went ahead. The ACLU later said the brief was "baseless, irregular, and alarming." Here is a question we normally would not feel the need to ask at all. We normally would not inquire exactly who would take over a vital job at the Justice Department if the person currently doing that job was fired. But this is not a normal time at the Department of Justice. President Trump has repeatedly criticized Deputy Attorney General Rod Rosenstein, who oversees the work of special counsel Robert Mueller. If Rosenstein should leave, that job would fall to the third in command there, Noel Francisco. He is currently the solicitor general, the Trump administration's chief advocate to the Supreme Court. And NPR's Carrie Johnson has this profile. CARRIE JOHNSON, BYLINE: Noel Francisco is a member of the conservative legal elite. A clerkship with the late Supreme Court Justice Antonin Scalia in 1997 launched his career. A few years later, Francisco was on the way to Florida to work around the clock on one of the biggest cases in the country. His mentor, Chuck Cooper, remembers. CHUCK COOPER: Oh, yeah. Well, the one that sticks out my mind is Bush v. Gore. JOHNSON: That election recount case came out, of course, in favor of George W. Bush. Soon Francisco was headed to the White House counsel's office and then the Justice Department. Along the way, he defended the firings of U.S. attorneys during the Bush years, and he wrote a Wall Street Journal op-ed in 2016 arguing the FBI treated Hillary Clinton with, quote, "kid gloves." But ask Francisco, and he'll say his story begins with his father. Born in the Philippines in 1935, he struggled during World War II before moving to the U.S. and becoming a doctor. NOEL FRANCISCO: He once told me how as a young boy, he was forced to live in the remnants of a bombed-out tank. Whenever I've faced the joys or the difficulties of life, I think of that little boy. JOHNSON: That was Francisco at a Senate hearing last May, only hours after President Trump fired FBI Director James Comey. Francisco's current job is not without difficulties. He's the solicitor general, the administration's top representative to the Supreme Court. But he's also next in line to supervise special counsel Robert Mueller. That's the man appointed to lead the Russia probe after Comey's dismissal. Longtime friend Senator Ted Cruz of Texas says Francisco is a steady figure. TED CRUZ: Noel is very even-keeled. He's steady. Nothing rattles him. He's someone you want leading during a crisis. JOHNSON: Lawyers who have worked with Francisco in the past say they're not sure what he'll do if he's asked to get rid of the special counsel or somehow limit the Russia investigation. In 2007, Francisco told Congress he's not a fan of special prosecutors. He said he'd rather the Justice Department do those investigations itself. Trump ally Chris Christie recently told ABC News that overseeing a huge investigation may not be the best fit. CHRIS CHRISTIE: To tell you, Noel Francisco, very talented lawyer - but to be solicitor general, you have a specific skill set, and running Russia collusion investigation is probably not one of them. JOHNSON: Francisco actually does have experience with high-profile public corruption cases. He's successfully represented former Virginia Governor Bob McDonnell, ultimately persuading the Supreme Court to throw out his conviction on corruption charges. Now he's appearing before the court as the voice of the Trump administration. At his confirmation hearing, Francisco said he had a responsibility beyond just winning or losing. FRANCISCO: After all, the Department of Justice's goal is not just to win but to ensure that justice is served. JOHNSON: But to lawyers who practice before the court, one thing stands out so far - Francisco's decision to ask the justices to throw out a federal appeals court ruling in favor of an undocumented minor who wanted an abortion. The court filing also suggested the American Civil Liberties Union lawyers representing that girl should face disciplinary charges. The incendiary language in the brief prompted bipartisan outcry. Two sources told NPR people had urged the solicitor general not to file the document. These days, Francisco's friends say he's too busy to make much time for them, but sometimes he manages to show up for friendly poker games. His former law partners say Francisco's an excellent player because, they say, he knows how to read a room. Carrie Johnson, NPR News, Washington. (SOUNDBITE OF BOARDS OF CANADA'S "CHROMAKEY DREAMCOAT") Transcript provided by NPR, Copyright NPR.